We started the evening with a free 30 minute organ recital at the National Concert Hall. It was riveting. Truly. The organist was like a one man band. We were sitting up in the choir section and could see his hands and feet and the keys and pedals. I guess I didn’t realize that the pedals of an organ are like a keyboard with whole and half steps. Good grief. It was awesome. Then we wandered around and ended up at the GPO (general post office) where they were handing out free postcards with a stamp and Shane and I each sent one to Seattle. The chickpeas had sour cream, so the girl scooped a big portion of them for Shane, in addition to our enormous platter of other dishes. The Abbey St. Govinda’s always serves up crazy amounts of food. Then we walked towards St. Stephen’s Green. I had a vague idea of the rough location of my friend Liu’s art studio. I knew it was somewhere near Stephen’s Green. I’m still amazed we found it. But I’m really glad. I’ve seen her art on her blog, but in person it is much more vibrant and lovely. Fun evening. Lots of people out being nutty. It was pretty cool to be out after dark and still have places besides the pubs and centra open. The next morning, we mowed through our beans on toast and rushed to go to the bus, but stopped when we saw that the hotel staff had kindly put our bikes out for us. We hadn’t asked and weren’t planning on riding to the bus stop, but we didn’t have time to mess with getting them put back, so we rode, and nervously attached our bikes to a parking barrier at the bus terminal. We rode southwest for about an hour. En route, a lady joined us in full mid-19th century costume. I decided she was going the same place as us, and was proven right as we left the bus with the woman in front of Cregneash Village. She disappeared, and Shane and I wandered a bit, looking at horses and sheep until the museum opened. There wasn’t really much to look at. Only a few buildings and exhibits There was a video about the way people lived in the village a hundred years ago and more. We’re always happy when the employees at living history museums act like normal modern people and don’t try to put on an act. That makes Shane nervous. So, it was nice to just pop our heads in, see what there was to see, have a conversation about the weather and whatever spinning/weaving apparatus we see and move on to the next cottage. We found the lady from the bus spinning. She and I talked about fiber and knitting groups and then a Manx cat wandered in and climbed on her lap. She was the only Manx cat we saw on the Isle of Man, but she was super cute and friendly, so that was enough. We lunched at the museum cafe and walked back to the main town to catch the steam railcar back to Douglas. By this time, it had started raining quite a bit and we knew our bicycles were going to be soggy, but we got on another bus into Peel. The weather was miserable by the time we arrived, but we toured the dilapidated, overgrown castle, watched the sandcastle contest going on at the beach, and wandered around town. The weather just got worse and worse as the afternoon progressed and riding the short distance from the bus to the hotel, we were nearly soaked through. We had a very mediocre dinner at the Hilton and reluctantly returned through the rain to our room. In the morning, we got on our bikes and rode to the ferry terminal. It was a really funny feeling to ride my bicycle into the ferry as though I was a car. Both on the way there and back, the ferry employees had us board before the cars. It was almost like being in a parade. This time, the ferry actually left 15 minutes early. Awesome. This trip was going to be good. Or not. 20 minutes in, Shane and I both started feeling very ill. The boat was rocking a lot and slapping down into the waves over and over. Shane is one who always gets motion sick, but I was the one who vomited. But I felt much better afterward and had recovered enough to ride home from the Dublin Port with plenty of energy. I don’t think we’ll go back. At least, not for several years. But it was fascinating and picturesque and amusing in turns. I was worried the proprieters would have to wait up for us, but when we arrived, the bar was full and drunken folk were having a grand time. We crawled up to our room and slept on a bed which Shane later described as having the ridgey bumpy quality of a ribcage. But we slept pretty well. The next morning, we took our bikes on the Electric train into Laxey and then took another train up to the highest point on the Isle of Man. It was really foggy, so we couldn’t really see anything, but on clear days you’re supposed to be able to see six kingdoms. Ireland, Wales, Scotland, England, the sea(? ), and the Isle of Man. Right. I guess we saw the kingdom we were on. After I nearly got blown over by the crazy wind, we got back on the train and came back to Laxey, looked around, ate lunch, and decided to cycle back to Douglas. It was a lovely ride, although pretty challenging at times, and we found a knitting shop and got to the museum in Douglas 40 minutes before it closed. I chose Chinese for dinner. It had been a really long time since I’d had Chinese food and I wasn’t disappointed at all. It was a good day. We put our bikes in the TV room and feel asleep on our double ribcage. It was great. Really lovely. It didn’t hurt that the weather was beautiful. Perfect. Shane and I bicycled all around this flat, beautiful, friendly city. 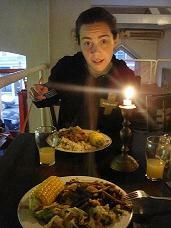 We went to exhorbitant art museums, rode down the Amstel river and saw windmills, ate at a vegetarian/anarchist collective (3 courses for 5 euro! And it was really good! ), and made some new friends. We found knitting shops, game shops, and natural food shops. We accidentally wandered through the red light district on our last day. I spoke a little Dutch everywhere I went. I felt very intrepid on my bicycle, even though I wasn’t as competent as the locals, but it was totally exhilirating. All around very pleasant. We’ll definitely be back. No, I don’t have chickenpox or anything. For the last several weeks, Shane and I have been feeling ready to go home. I mean home to the states. I’m not sure what triggers it, but I find myself overcome with waves of homesickness. Generally once every couple of days. I’m starting to hear about events and activities that I may actually be able to attend. I’m thinking about how I’m going to manage being without my yarn for 8 weeks. Especially right before Christmas. Shane didn’t fall for my idea to simply buy more yarn. I tried. I’m hoping the cats haven’t really gotten too chubby. We were supposed to put them on a diet already, but it sounds like the Shane’s parents have been spoiling them and all involved are enjoying themselves. We’ve been talking for months about what we’ll miss in Ireland. We’ve been talking for longer about what we miss in Washington. But we can always come back. And even though I never had a specific interest in Ireland, I’m sure we won’t be able to stay away. Dublin is another home to us, now. Despite the sorry lack of good burritos, and irritating banking situations, and absurdly low library check-out limits, I have come to appreciate this place and the generous, relaxed, stalwart, honest, open people I’ve come to care about. Look out, my darling chubby cats. You’ve got about 6 weeks left. Better make them good. Still knitting. Finished these a bit ago. I’m pleased with them, but haven’t found occasion to wear them out of the house, yet. I’m thinking about sewing a skirt to go with them when I get home. Let me tell you, the lace edging was a pain in the behind.